Health Fair Connections | What's the difference between the free and paid ad options? As you might have noticed by now, HFC is not like your typical, third-party health fair company. We're not charging you for health fair booths on a first come / first serve basis. In fact, we're not charging for health fair booths at all. HFC offers a free option to health fair exhibitors, believe it or not. * We refer to it as the basic, free ad. So, HFC gives you and your fellow exhibitors a chance to stand out in front of companies hosting health fairs to your liking with either a free/basic or a paid/high chance ad. As you can see above, there are quite a bit of extra perks when selecting the, risk-free, only pay if selected "paid" ad. The paid ad option is risk-free and you're not charged if selected. 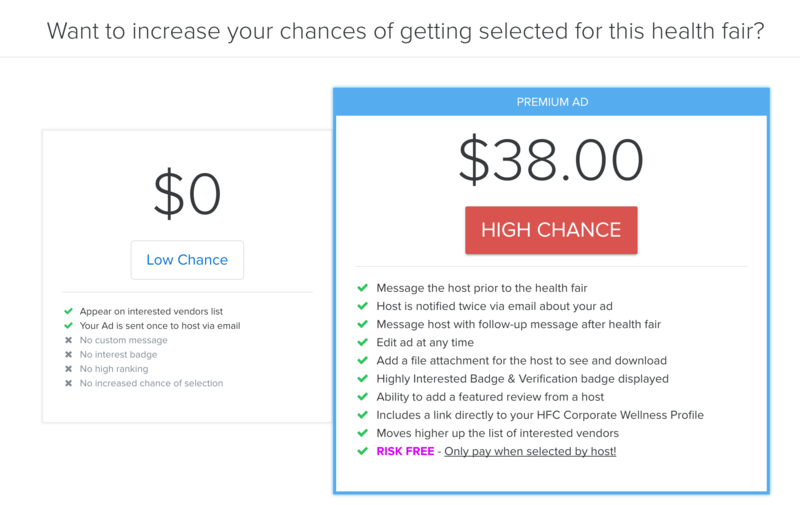 Even if you do not get selected, you still receive free value by going with the paid ad like two notification emails, a premium listing, and the ability to ask the hosting company a question. In all honesty, the paid ads are the smartest (and most chosen) option of the two. Not to mention, soon exhibitors/vendors will be rewarded via HFC credits for picking the "high chance" option, whether they're selected or not.